Hire Close-Up Magicians - London Close-up Magician hire - Christopher Howell & Co. If you've ended up on this page, you're probably looking to hire close-up magicians. You can look a bit closer now... 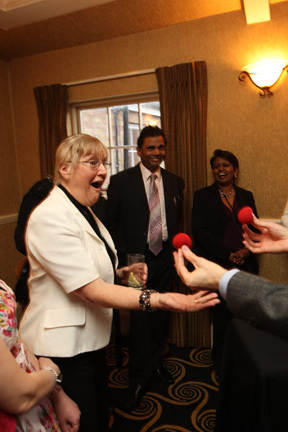 If you hire Christopher Howell as your magician, your guests should be prepared for a show that they'll never forget. His performance approach is entertaining and sophisticated and clients tell us repeatedly that his magic continues to be talked about long after the event has drawn to a close. Christopher performs throughout Greater London, around the UK and abroad. In his close-up magic performances, he often borrows objects from guests that he uses to perform with and they frequently help out with what's going on. Live magic. Close quarters. Unforgettable. He is in great demand for his work presenting his magic close-up as a wedding magician, for London corporate events and private parties year round. Why hire a close-up magician? Close-up magicians perform magic for small groups of guests either as they mingle with drinks and canapes or are seated at tables. The power of professionally-presented close-up magic is indisputable, as it happens inches away from the audience's very own eyes and is unmatched as an icebreaker to help get people interacting. Christopher performs with a variety of objects including cards and items borrowed from the audience. It’s flexi-time, depending on your needs, the number of guests, and the length of your event - so close-up magicians can work around the other things you have planned for the event. It's great entertainment at weddings, corporate functions and private parties in homes. If alll these things are great reasons for convincing you to hire close-up magicians, then why is Christopher the magician for you? Check out what others have said and visit our Home page to watch his video.